« How Becky Hammon, Ground-breaking NBA basketball Assistant Coach, Can Inspire Writers, too! What Makes You Read On? Does your book exemplify that? In September I was assigned three other members from the Women’s Fiction Writers Association to see if we would gel as an online critique group. We’ve had some bumps, and although all three of the other women are excellent critiquers, I’m not sure yet if I’ll continue, mostly due to the heavy reading load. For our first go-round we tried ten pages a week. This went fast and was easily handled. We all have manuscripts that are in final draft stage, so we are understandably impatient at the snail’s pace of ten pages each a month. This month we’re doing 50 pages each for a total of 150 pages. I also belong to a local critique group (WURDZ), which meets every other week. Last week I had between 40 and 50 pages to read for that. In the last ten days I read over 100critique pages. I also work part time and have other things to do, including my blog post. Needless to say, I did not get much new writing done. I am not sure I can keep up the pace of possibly 200-250 pages a month. Both groups include writers of very different genres/styles. One of the women in WURDZ stated she wrote “commercial” fiction. Two others write fantasy/literary fantasy. The online group consists of a historical fiction writer, another more commercial writer of women’s/romance/mystery-thrillers, and the last writes women’s fiction which may be literary. Today one of the online group members posted some openings to bestsellers, all but one of which were a decade or more old. I had read, or started to read, two of the aforementioned bestsellers, The Hunger Games (Suzanne Collins) and Good in Bed (Jennifer Weiner. Also included were Shutter Island (Dennis Lehane) and The Cold Dish (Craig Johnson). I found four books I really enjoyed, two of which were a few years older than the bestsellers. The other two were more current. 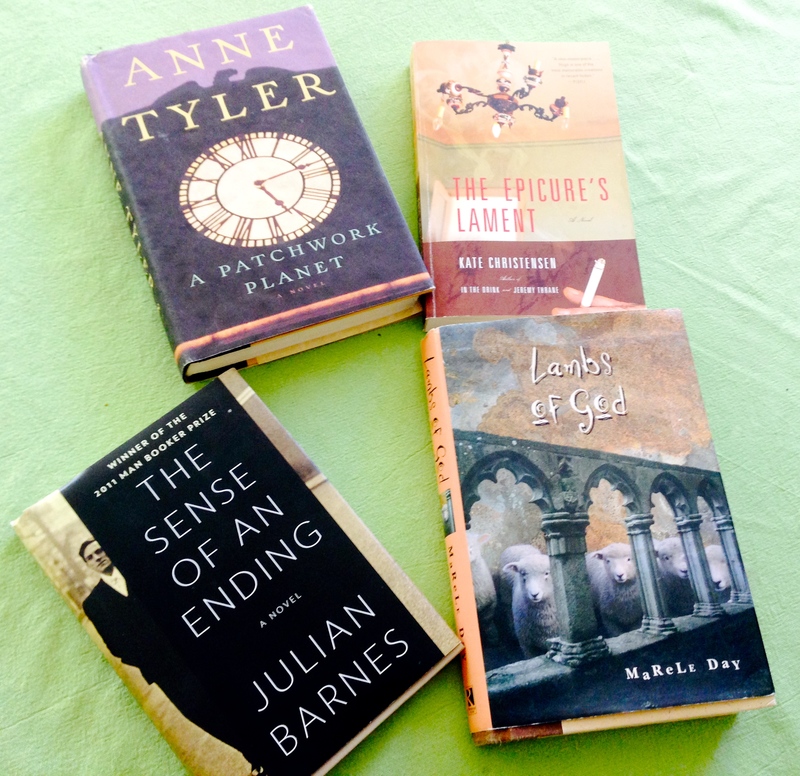 My four books were A Patchwork Planet (Anne Tyler), Lambs of God (Marele Day), The Epicure’s Lament (Kate Christensen), and The Sense of an Ending (Julian Barnes). At least three of those authors are major award winners. The woman who posted analyzed why she felt each of the openings worked. Her question come down to “what is going on and why?” Those would appear to be good questions. All four of my openings raised the same questions, but more obliquely. Although of mild interest, the questions weren’t what primarily drove me to continue reading. I believe what all four of mine have in common is voice. This shouldn’t have been a surprise to me since I’ve written other posts about voice and how it is of utmost importance, but I found it edifying. I’m often trying to write—especially beginnings—to satisfy the perceived demands of agents as expressed by my writing partners, writing conferences, and workshops. Maybe, as a writer and reader these aren’t qualities I enjoy and want to primarily foster. Possibly I’ve set myself an impossible task as it is hard to get an agent to buy on the strength of voice when all they have is my query letter. Possibly they would say voice doesn’t sell. They very well may be correct. It is also highly possible that my voice isn’t good enough to sell a story on that alone. What, then, are my choices? I could stop writing altogether, but I’m not ready to do that. I could reframe each story to the demands of the market, whatever those shifting demands are. After talking with an editor this summer, I tried to reshape a manuscript to what she was looking for. I soon lost interest. My best option would be to find an agent who specializes in voice and happens to find mine to her liking. This is possible but not necessarily likely to happen. The last option I see is to switch genre. The first story idea I had as an adult was in the realm of science fiction. I read science fiction as a teenager. I’ll continue to desultorily market some of my other finished manuscripts, but I think it is time to switch. The question is, do I continue with my current critique groups, especially in light of the time they are taking? Can you identify what makes a book opening most intriguing to you? Does that have much to do with if you read on or not? Does your writing match the sort of opening you prefer? This entry was posted on October 13, 2014, 3:12 pm and is filed under Reading, Writing. You can follow any responses to this entry through RSS 2.0. You can leave a response, or trackback from your own site. I try to exemplify in my own work what I enjoy most in a book. Sometimes it’s difficult to see when you’re not doing this, and that’s where critique groups come in handy. That is a lot of reading. I’m reading a lot, too, especially since I often read twice when critiquing. If you’re not getting help from a group that’s equal to the time you give up, maybe it’s not worth it. I used to read everything twice but with that many pages, I’m lucky I get through it all once! I do read parts more than once and I try to at least skim a second time if possible. That’s a good way to look at it–am I getting a return on my time investment.